Siren - Natural Order - Advance Preview: "Fight Time!" This week’s Siren is all about survival of the fittest as Katrina and Ryn face off, Helen faces some surprising revelations regarding her family, Maddie’s mother continues to grow suspicious, Ben & Ryn face some serious angst and Xander grapples with his guilt over his father’s death. For those who’ve watched the promo, you’ll know that Ryn isn’t looking too good this week. For those who haven’t watched, being out of the water is starting to catch up with Ryn. The mermaid water time was interrupted last week by drunken revellers, and Ryn’s skin is beginning to look patchy. This massively worries Ben and Maddie, who look for an alternative housing solution for the mermaids as they once again come close to being uncovered, and of course they’re not the only ones to pick up on Ryn a bit under the weather. Last week’s episode made it pretty clear Katrina has no interest in being part of the pack, she wants to be leader, and Ryn is more than aware that she won’t stop until she accomplishes that. Unfortunately the mermaid way of resolving their differences isn’t something that Ben agrees with, and that massively causes a big ton of friction between him and Ryn. His actions are something that Maddie picks up on and questions him about what’s going on in his head, and that leads her and Ryn to resort to an interesting method to try and better understand the situation, along with Ryn making a confession to Maddie. Thanks to Ben’s mother cutting off her funds, Helen isn’t doing so good financially, and that prompts Ben to step in and poke the bear. His mother explains her reasoning for being so reluctant to part with the family cash result in a surprising revelation regarding Helen’s family, and takes Ben on a mission to gather intel for Helen. Another on a mission is Maddie’s mother, determined to find out what exactly her father and Maddie are hiding. For the record her father hasn’t actually handed in his badge and given up on his job, he’s just on leave and is paid a visit by his Deputy this week who delivers news he’s not exactly keen on hearing. Maddie’s mother is no fool though and she knows she’s being kept in the dark over something. Maddie though is too busy in the mermaid drama to really have time for her mum this week, and I fear that’s an action that’ll come back to haunt her. Xander and the Military Doctor continue to grow close this week, in a plot I still don’t care much for. Thanks to a slip of the tongue, Xander finds the cabin where the mermaids have been seeking shelter, and in the aftermath of that, he relives the night of his father’s death and the fact he was powerless to stop it. One would hope that this will lead to Xander making his piece, but unfortunately I doubt that, and the fact he isn’t more suspicious of his lady friend riffling through his things and having a weak as hell excuse is enough to make my eyes roll into the back of my head and never return. 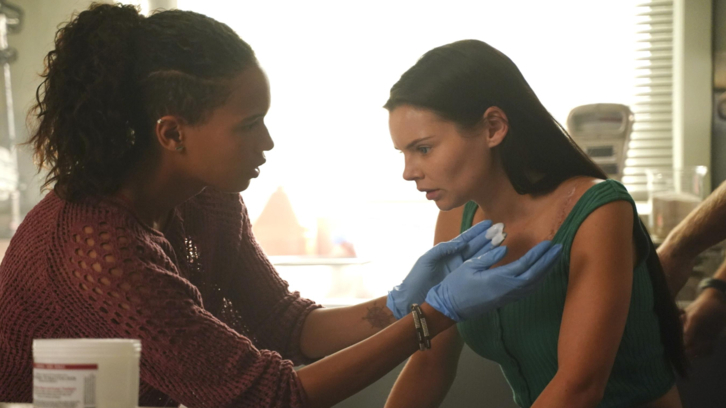 Siren continued to slowly ramp un the tension with ‘Natural Order’ and the episode once again ends on an interesting note for one of the characters as they continue to battle with their demons. Make sure you tune into Freeform this Thursday and check back here afterwards for all my post episode thoughts!